Easy ways to collect responses. Once you complete your work with form - you added questions you want, you have made the design you like, the form is ready for publication - you can do the next step Collect Responses. When planning a form, you’ve specify a targeted audience and know what you want to achieve. Considering the targeted audience you probably know where to get successful results. 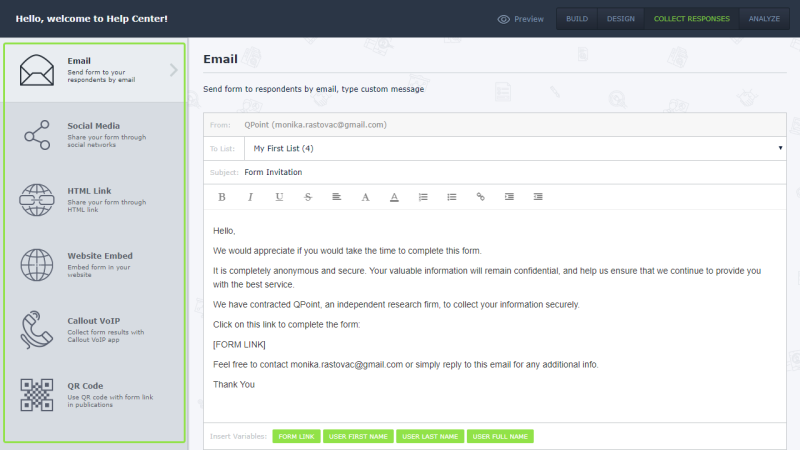 Collecting responses is simple and easy with QPoint. There are several ways of sharing the form and collecting results, and you can share your form in each of these ways. You are not limited by just one way. © 2019 Q-Bit d.o.o. All rights reserved.